IFIC Bank Limited is a leading commercial bank in Bangladesh. It has a good reputation and brand value in the financial market. The customers are very much interested about various products and services which are provided by IFIC Bank Limited. First of all, I made an overview of Foreign Exchange Department of IFIC Bank Limited, where I had completed my Internship Program. Here I tried to focus the bank’s history of organization, its mission, ownership structure, management structure, corporate objective, risk management joint venture abroad, technology and HRD. Then the next part of this report described about the Foreign Exchange activities of IFIC Bank Limited that includes Foreign Exchange Department, Function of Foreign Exchange, Import, Export, Import Procedure, Letter of credit. Type of letter of credit, L/C opening procedure, Contents of the Letter of Credit, Documentary Letter of Credit, L/C Opening of IFIC, Open an L/C by the Importer, Lodgment of Import Bill, Procedure of Lodgment, Retirement of Documents, Disposal of IMP Form, and Remittance section as well., I have tried to shown in this report how daily activities are executed and things are getting done. I also have identified the Strength, Weakness, Opportunities and Threats regarding Foreign Exchange section which turned into problem identification regarding that particular section putted some recommendation relating to that problem in my recommendation section, and finally drawn conclusion appendices and bibliography as well. International Finance Investment and Commerce Bank Limited (IFIC Bank) is a banking company incorporated in the People’s Republic of Bangladesh with limited liability. It was set up at the instance of the Government in 1976 as a joint venture between the Government of Bangladesh and sponsors in the private sector with the objective of working as a finance company within the country and setting up joint venture banks/financial institutions abroad. The Government held 49 per cent shares and the rest 51 per cent were held by the sponsors and general public. In 1983 when the Government allowed banks in the private sector, IFIC was converted into a full-fledged commercial bank. The Government of the People’s Republic of Bangladesh now holds 35% of the share capital of the Bank. Leading industrialists of the country having vast experience in the field of trade and commerce own 34% of the share capital and the rest is held by the general public. Generally by the word “Bank” we can easily understand that the financial institution deals with money. But there are different types of banks like; Central Banks, Commercial Banks. Savings Banks, Investment Banks, Industrial Banks, Co-operative Banks, etc. But when use the name term “Bank” without any prefix, or qualification it refers to the Commercial banks. Commercial Banks are the primary contributor to the economy of a country. So we can say Commercial Banks are a profit making institution that holds the deposit of the individuals & business in checking & saving account and than uses these funds to make loans. For these, people and government are very much dependent on these banks as the financial intermediary. As banks are profit earning concern; they collect deposit at the lowest possible cost and provide loans and advanced a higher cost. The differences between two are the profit for the bank. Banking sector is expanding its hand in different events every day. At the same time the banking process is becoming faster, easier, and the banking area becoming wider. As the demand for better service increases day by day, they are coming with different innovative ideas and products. In order to survive in the competitive field of the banking sector, all banking organization are looking for better service opportunity to provide their fellow clients. As a result, it has become essential for every person to have some idea on the bank and banking procedure. The banking sector is the main force which keeps healthy atmosphere for moving forward the wheels of production, trade and consumption by giving required bank credits in the development process. Compared with other banks, the Public Sector Commercial Banks being such an important force in the development process of Bangladesh. Recently, this sector faces serious crisis of the huge amounts of non-performing loan which hamper the growth trend and crush the backbone of our economy. The popular notion is that the main cause of this bad situation is borrowers’ repayment tendency, huge amount of government loan, corruption in banking sector and other socio-economic problems. So, this study is a modest attempt to find out the increasing default problem of bank loan & its effect on public sector commercial bank’s growth as well as our socio-economic condition with some recommendations. To identify the foreign exchange activities in Nawabpur Road Branch of IFIC Bank Limited. To identify problems related to Foreign Exchange activities of IFIC Bank, Nawabpur Road Branch. To recommend possible solutions of the problems those are identified at the time of doing internship. To identify the strengths and weaknesses involved with the foreign exchange activities in Nawabpur Road Branch of IFIC Bank Limited. To gather some practical knowledge that will be helpful for my future career growth. It was very difficult to collect the information from various personnel for there time constraint. Relevant papers and documents were not available sufficiently. As if IFIC Bank is a private Bank they are conservative in supplying about their data. As a result it was not possible for me to get all the data required. The department all people always remain busy due to heavy pressure of work so that they could not spare sufficient time. Information used in this report has been collected from both primary and secondary sources. Primary data were collected mainly through personal observation of the approval process and monitoring techniques, informal interviews of executives, officers and employees of IFIC Bank. Maximum information were collected from the secondary sources, which include books, publications, reading materials and various circulars and annual reports published by IFIC Bank. ü Informal interviews of employees in Foreign Exchange Division. ü Files and documents of the Branch. ü Annul report of IFIC Bank Ltd 2008.
ü Different paper of IFIC Bank Ltd.
ü Different books and periodicals related to foreign Exchange. This is a descriptive report aimed at depicting the foreign exchange activities in Nawabpur Road Branch of IFIC Bank Limited. The data/information gathered from both primary and second sources were arranged to get a clear picture about the foreign exchange activities in Nawabpur Road Branch of IFIC Bank Limited. The study includes both qualitative and quantities analysis of the Nawabpur Road Branch of IFIC Bank Limited foreign activities such as appraisal criteria, process, methods, guidelines etc. Based on the observational information, I tried to evaluate and analyze the problems involved with the foreign exchange activities in Nawabpur Road Branch of IFIC Bank Limited. International Finance Investment and Commerce Bank Limited (IFIC Bank) is a banking company incorporated in the People’s Republic of Bangladesh with limited liability. It was set up at the instance of the Government in 1976 as a joint venture between the Government of Bangladesh and sponsors in the private sector with the objective of working as a finance company within the country and setting up joint venture banks/financial institutions abroad. The Government held 49 per cent shares and the rest 51 per cent were held by the sponsors and general public. In 1983 when the Government allowed banks in the private sector, IFIC was converted into a full-fledged commercial bank. The Government of the People’s Republic of Bangladesh now holds 35% of the share capital of the Bank. Leading industrialists of the country having vast experience in the field of trade and commerce own 34% of the share capital and the rest is held by the general public. The mission of IFIC Bank Ltd is to provide service to our clients with the help of a skilled and dedicated workforce whose creative talents, innovative actions and competitive edge make our position unique in giving quality service to all institutions and individuals that we care for. The Bank authority is committed to the welfare and economic prosperity of the people and the community, for we drive from them our inspiration and drive for onward progress to prosperity. To set high standards of integrity and bring total satisfaction to their clients, shareholders and employees. To become the most sought after bank in the country, rendering technology driven innovative services by their dedicated team of professionals. The government of the people republic of Bangladesh now holds 35% of share capital of the bank. Leading industrialists of the country having vast experience in the field of trade and commerce own 34% of the share capital and the rest is held by the general public. IFIC bank has been consistently maintaining the “Capital Adequacy Ratio”, as prescribed by Bangladesh Bank. This has been made possible by a policy of building up both capital and reserves. It started with an authorized and paid up capital of TK. 100 million and TK. 63.20 million respectively in 1983. Authorized and paid up capital increased to TK. 500 million and TK. 406.39 million respectively in 2005. In addition to paid up capital, the bank has built up a strong reserve base over the years. As against TK. 21.20 million only in 1983, reserves and surplus increased to TK. 809.10 million in 2004. Besides, the bank had 1% General reserve worth TK. 393.31 million as on DECEMBER 31, 2005. The thirteen members of the Board of Directors are responsible for the strategic planning and overall policy guidelines of the Bank. Further, there is an Executive Committee of the Board to dispose of urgent business proposals. Besides, there is an Audit Committee in the Board to oversee compliance of major regulatory and operational issues. The CEO and Managing Director, Deputy Managing Director and Head of Divisions are responsible for achieving business goals and overseeing the day to day operation. The CEO and Managing Directors are assisted by a Senior Management Group consisting of Deputy Managing Director and Head of Divisions who supervise operation of various Divisions centrally and co-ordinates operation of branches. Key issues are managed by a Management Committee headed by the CEO and Managing Director. This facilitates rapid decisions. Commitment to its clients at each level. The company believes that communication with, and feedbacks from its clients help it achieve its goal of providing world-class product and services. IFIC Bank regularly conducts client satisfaction surveys and make immediate accommodations and adjustments where needed. It also constantly monitors its standards, and strives to meet clients’ requirements. Since the beginning of its journey as a commercial bank in 1983, IFIC Bank has been giving great emphasis on the adoption of modern technology. It became the pioneer in the field of automation by introducing computerized branch banking right in the same year. Subsequently, all the branches were brought under similar automated platforms with upgraded software applications to offer all the critical banking features. At present all 76 domestic branches are fully computerized under networked environment. Academy is fully equipped with a professional library, modern training aids and professional faculty. Library has about 4941 books on banking, economics, accounting, management, marketing and other related subjects. Main training activities consist of in-depth foundation programs for entry level Management Trainees. Specialized training programs in the areas like general banking, advance, foreign exchange, marketing and accounts etc. are also organized by the Academy depending on need. Frequently outreach programs are organized to meet demand for new and specialized skills. During its 23 years of existence, Academy not only conducted courses, workshops and seminars as required by the Bank, but it also organized training programs for the Bank of Maldives, Nepal Bangladesh Bank Limited and Oman International Exchange LLC. In addition, Academy has also the credit of organizing system of Bank of Maldives. In addition to conducting courses internally, The Academy also selects candidates for nomination to various courses conducted by distinguished training organizations in the country including BangladeshBankTrainingAcademy and Bangladesh Institute of Bank Management. The Academy also re-designs its courses, programs etc, regularly to meet the requirement of new skills arising out of various directives, guidelines of the Central Bank and significant changes in the banking sector from time to time. Foreign Exchange is a process which is converted one national currency into another and transferred money from one country to another country. Foreign Exchange Dept. is the international dept. Bangladesh bank issues license to scheduled banks to deal with foreign exchange. These banks are known as Authorized Dealers. If the branch is authorized dealer in foreign exchange market, it can remit foreign exchange from local country to foreign countries. So IFIC Bank, Nawabpur Road Branch is an authorized dealer. According to Mr. H. E. Evitt. Foreign Exchange is that section of economic science which deals with the means and method by which right to wealth in one country’s currency are converted into rights to wealth in terms of another country’s currency. It involved the investigation of the method by which the currency of one country is exchanged for that of another, the causes which rented such exchange necessary the forms which exchange may take and the ratio or equivalent values at which such exchanges are effected. Foreign exchange is the rate of exchange in the both country’s currency. International trade refers to trade between the residents of two different countries. Foreign Exchange Department is international department of Bank. It deals globally. It facilities international trade through its various modes of services. It bridge between importers and exporters. If the branch is authorized dealer in foreign exchange market, it can remit foreign exchange from local country to foreign country. This department mainly deals in foreign currency. This is why this department is called foreign exchange department. ii) How the rate of exchange works. iii) Forward and spot rate. iv) Methods of quoting exchange rate. vi) Risk of exchange rate. vii) Causes of exchange rate. 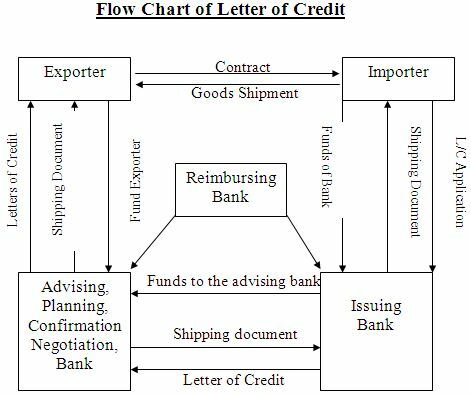 xiv) Export and import letter of credit. xv) Non-commercial letter of trade. xvi) Financing of foreign trade. xvii) Nature and function of foreign exchange market. When goods and services are brought from the country for the fulfillment of the customer needs or their own needs is called import & who is involving in this procedure Is called importer. a) Ability: The letter of credit enables the importer of purchase materials without making full advance payment. Invoice ate. The quality and quantity of the goods consigned is assured. c) Without payment: Prided the buyer has buying credit with the prime bank he may get goods released by the bank under trust (e.s, LTR,LIM etc) i.e. without payment and pay for then on sale. When good and services are brought from your country to other countries for the fulfillment of their customer needs their own needs is called export & who is involving in this procedure is called exporter. a) Undertaking: A superior undertaking of the bank under the latter of credit assures the importer then when the documents are tendered as per the turns of the credit payment would be made to him. Import section of any Bank deals with L/C opening and post import financing i.e. LIM & LTR. Now the procedure from opening L/C to disbursement against L/C is given below. A letter of credit is an instrument issued by a bank to a customer placing at the letters disposal such agreed sums in foreign currency as stipulated. An importer is a country requests his bank to open a credit in foreign currency in favor of his exporter at a bank in the letters country. The letter of credit is issued against payment of amount by the importer or against satisfactory security. The L/C authorizes the exporter to draw a draft under is terms and sell to a specified bank in his country. He has to hand over to the bank, will the Bill of exchange, shipping documents and such other papers as may be agree upon between the exporter and the importer. The exporter is assured of his payment because of the credit while the importer is protected because documents in respect of export of goods have to be delivered by the exporter to the paying bank before the payment is made. (i) Revocable L/C: If any letter of credit can be amendment or change of any clause or canceled by consent of the exporter and importer is known as revocable letter of credit. A revocable letter of credit can be amended or canceled by the issuing bank at any time without prior notice to the beneficiary. It does not constitute a legally binding undertaking by the bank to make payment. Revocation is possible only until the documents have been honored by the issuing bank or its correspondent. Thus a revocable credit does not usually provide adequate security for the beneficiary. (ii) Irrevocable L/C: If any letter of credit can not be changed or amendment without the consent of the importer and exporter is known as irrevocable letter of credit. Irrevocable credit constitutions a firm undertaking by the issuing bank to make payment. It therefore, gives the beneficiary a high degree of assurance that he will paid to his goods or services provide he complies with terms of the credit. (i) Sight payment credit: The most commonly used credits are sight payment credits. These provide for payment to be made to the beneficiary immodestly after presentation of the stipulated documents on the condition that the terms of the credit have been complied with. The banks are allowed reasonable time to examine the documents. (ii) Deferred payment credit: Under a deferred payment credit the beneficiary does not receive payment when his presents the documents but at a later date specified in the credit. On presenting the required documents, he received the authorized banks written undertaking to make payment of maturity. In this way the importer gains possession of the documents before being debited for the amount involved. In terms of its economic effect a deterred payment credit is equivalent to an acceptance credit, except that there is no bill of exchange and therefore no possibility of obtaining money immediately through a descant transaction. In certain circumstances, how ever, the banks payment undertaking can be used as collateral for an advance, though such as advance will normally only be available form the issuing or confirming bank. A discountable bill offers wider scope. (iii) Acceptance Credit: With an acceptance credit payment is made in the form of a tern bill of exchange drawn on the buyer, the issuing Bank or the pendent bank. Once he has fulfilled the credit requirements, the beneficiary can demand that the bill of exchange be accepted and returned to him. Thus the accepted bill takes the place of a cash payment. The beneficiary can present the accented bill to his own bank for payment at maturity or for discounting, depending on whether or not he wants cash immediately. For simplicities sake the beneficiary usually gives on instruction that the accepted bill should be left in the safekeeping of one of the banks involved until it matures. Bill of exchange drawn under acceptances credit usually has a term of 60-180 days. The purpose of an acceptance is to give the importer time to make payment. It he sells the goods before payments fall due, he can use the proceeds to meet the bill of Exchange in this way, he does not have to borrow money to finance the transaction. (vi)Negotiation credit: Negotiation means the purchase and sale of bill of exchange or other marketable instruments. A negotiation credit is a commercial letter of credit opened by the issuing bank in the currency of its own country and addressed directly to the beneficiary. The letter is usually delivered to the addressee by a correspondent bank. This credit is sometimes also as Hand on credit. The letter of credit empowers the beneficiary to draw a bill of exchange on the using bank, on any other named drawer or on the applicant for the credit. The beneficiary can present this bill to a bank for negotiation, together with the original letter of credit and the documents stipulated therein. Payment of the bill of exchange is guaranteed by the issuing bank on the condition that the documents presented by the beneficiary are in order. The most common form of negotiation credit permits negotiation by any bank. In rare case the choice is limited to specified banks. (iv) Red clause credit: In the case of a red clauses credit, the seller can obtain an advance for an agreed amount from the correspondent bank, goods that are going to be delivered under the documentary credit. On receiving the advances, the beneficiary must give a receipt and provide a written undertaking to present the required documents before the credit expires. The advance is paid by the correspondent bank, but it is the using bank that assumes liability. If the sellers does not present the required documents in time and fails to refund the advance, the correspondent bank debits the issuing bank with the amount of the advance plus interest. The issuing bank, in turn, has reveres to the applicant, who therefore bears the risk for the advance and the interest accursed. The clause permitting the correspondent bank to make an advance used to be written on red in home the name red clause credit. (v) Revolving Credit: Revolving credit can be used when goods are to be delivered in installment at specified intervals. The amount available at any one time is equivalent to the value of one partial delivery. A revolving credit can be cumulative or non-cumulative means that amount from unused or incompletely used portions can be carried forward to subsequent period. If a credit is non-cumulative, portions not used in the prescribing period case to be available. (vi) Stand by credit: Stand by credit is encountered principally in the US. Under the laws of most US states, banks are prohibited from issuing regular quarantines, so credits are used instead. In Europe, too the use of this type of credit is increasing by virtue of their documentary credit, stand-by credit are governed by the UCP. However, their function is that of a grantee. – Payment of goods delivered. – Execution of construction contracts, supply and install contracts. In order to enforce payment by the bank, the beneficiary merely presents a declaration stating that the applicant for the credit has failed to meet his contractual obligation. This declaration may have to be accompanied by other documents. (vii) Transferable credit: transferable credits are particularly well adapted to the requirements of international trade. A trader who receives payment from a buyer in the form of a transferable documentary credit can use that credit to pay his own supplier. This enables him to carry out the transaction with only a limited and lay of his own funds. The buyer supplies for an irrecoverable credit issued in the traders favors. The issuing bank must expressly designate the credit as transferable. As soon as the trader receives the confirmation of credit he can request the bank to transfer the credit to his supplier. The bank is under no obligation to affect the transfer except in so far as it has expressly consented to do so. The costs of the transfer are usually charged to the trader and the transferring bank is entitled to delete them in advance. The importer after receiving the Performa invoice from the exporter, by applying for the issue of a documentary credit, the importer request his Bank to make a promise of payment to the supplier. Obviously, the bank will only agree to this request if it can rely on reimbursement by the applicant. As a rule accepted as the sole security for the credit particularly if they are not the short of commodity that can be traded on an organized market, such an arrangement would involve the bank in excessive risk outside its specialist field. The applicant must therefore have adequate funds in the bank account or a credit line sufficient to cover the required amount. Banks deal in documents and not in goods. Once the bank has issued the credits its obligation to pay is conditional on the presentation of the stipulated documents with in the prescribed time limit. The applicant cannot prevent a bank from honoring the documents on the grounds that the beneficiary has not delivered goods on redder reissues as contracted. b. Application and Agreement form. d. Necessary charge documents for documentation. The above documents / papers must be completed duly signed and filled in by the party according to the instruction of the banker. (ii) Bill of lading: A bill lading is a document of title to goods entitling the holder to receive the goods as beneficiary or endorsee and it is with the help of this document on receipt from the exporter that the importer takes possession of the goods from the carrying vessel at the port of destination. (iii) Airway bill / Railway receipt: When goods to be transported are small in bulk or requiring speedy delivery or those are perishable in nature on the deal is in between the neighboring countries then mode of transports other than shipping may be resorted to far the carriage of the goods Airways bill / Railway receipt take place of Bill of lading depending on the nature of the carrier. (iv) Commercial invoice: It is the seller’s bill for the merchandise. It contains a description of goods, the price per unit at a particular location, total value of the goods, packing specifications, terms of sale, letter of credit, bill of lading number etc. There is no standard form far a commercial invoice. Each exporter designs his own commercial invoice form. The invoice is made out by the seller under his signature in the name of the buyer and must be submitted in a set of at least 3 copies. Its main purpose is to check whether the appropriate goods have been shipped and also that their unit price, total value, marking on the package etc. are consistent with those given in other documents. (v) Insurance policy: In the international trade insurance policy is a must to cover the risk of loss on consignments while they are on seas, roads, and airways. The insurance is the responsibility of the buyers (consignee) under FAS, FOB and C&F contracts and of the seller (consignor) under CIF contract. The policy must be of the type as specified in the relative contract / credit. The policy would be for the value of CIF price plus 10 (ten) percent to cover the expenses and that is required to be obtained in the same currency as that of the credit and dated not later than the date of shipment with claims* being payable at the destination. It must be properly stamped. Like a bill lading it must be negotiable and be endorsed where it is payable to order. (vi) Certificate of origin: This is a certificate issued by a recognized authority in exporting country certifying the country of origin of the goods. It is usually by the Chambers of commerce. (vii) Packing list : The exporter must prepare an accurate packing list showing item by item, the contents of the consignment to enable the receiver of the shipment to check the contents of the goods, number and marks of the package, quality, per package net weight, gross weight, measurement etc. (viii) Wightman and Measurement: Issued by recognized authority (like chambers of commerce and industry) in exporting country certifying correct weightiest and measurement of the goods exported. (ix) Bill of entry: A bill of entry is a document which contains the particulars of the imported goods as well as the amount of customs duty payable. Today IFIC is one of the leading and most successful Banking enterprises in the country. It pays a great role in the economy of the country. By export-import business the Bank play a great role to the economy of Bangladesh. IFIC is one of the greatest banks in export-import business. Foreign trade plays a vital role in the economic advancement process of a nation. So the trend of country’s foreign trade, i.e. import & export is of a great concern to the government of a country. Fluctuation in the parameters of foreign trade immediately brings about some impact on the total economy. As such the nature, trend and the volume of foreign trade are required to keep peace with the national economic needs and objective. There may be some areas where emphasis is to be given while there may be others which deserve restrictions or discouragement. Moreover the items of import & export value and volume of the same, the corresponding time period, sources of fund far payment and receipt, all these factors are to be considered very carefully for making necessary adjustment to match with the national economic policies as well as achieve balanced economic growth through the Interpol icy and Interpol icy co-ordination. International trade policy relates to commercial policy which has two main components of Import policy relates to commercial policy which has two main components of Import policy and Export policy. With a view to achieving favorable balance of payment position as well as to encouraging or well to encouraging or well regulated and need based foreign trade of the country, the government formulates the national commercial policy i.e. import and export policy for a certain period considering all the favorable & unfavorable aspects of the nation’s previous trade performance as well as the future requirement and prospects. As the policy matter and the operational of import & export trade are quite different, two separate policies for import & export trade are formulated by the government. Import policy refers to government policies account for a particular fiscal period envisaging the allocation of fund available from various sources for import of certain quantity of certain goods. The main purpose of the policy is to conserve scare foreign exchange & to ensure its utilization for the import of goods and services which have national priority. The selected persons on institutions those who have got valid Import Registration Certificate (IRC) form the Chief Controller of Import and Export (CCI & E) can import and they are known as importers. These importers can import goods as entitled in each year as per import policy by opening letter of credit (L/C) through bank i.e. Authorized Dealer (A.D). Authorized Dealer means the branches of commercial banks, those who are authorized / licensed by the Bangladesh Bank to deal in foreign Exchange. Letter of Credit may be defined as the letter as the letter of undertaking or letter of guarantee issued by the L/C opening bank on behalf of the importer submits all the documents as mentioned in the L/C submits all the documents as mentioned in the L/C within the time schedule to his bank i.e. exporters bank. Before opening L/C in favors of the exporter the entitlement of the importer (total amount in taka he can import as per import policy) to be registered with Bangladesh Bank. For this purpose the importer is to apply through L/C. Authorization form (LC A form). This is a set in quintuplicate and the authorized dealer will issue LCA form to the individual importer at their request. After filled up and signed up the appropriate column of the LCA from, the importer will submit it to Authorized Dealer who interns forward the same to Bangladesh Bank for registration where fund is purchased from Bangladesh Bank. After registration Bangladesh Bank forward the 1st and 2nd copy of LCA form to the Authorized Dealer, 3rd and 4th copy to CCI & E and keep the 5th copy as their office copy. 1st copy of LCA is known as Exchange Control copy against which Authorized Dealer can open L/C at the request of the importer. 2nd Copy is known as custom purpose copy which will be handed over to the importer who will clear the goods from the port on its arrival through this custom purpose copy of LCA along with other shipping documents. b) Indent / Performa Invoice / Contract – 3 copies. c) Insurance cover note with premium paid receipt. d) IMP from one set duly signed by the importer. e) Any other documents if necessary. Authorized Dealer will scrutinize the documents and open the L/C in favor of the exporter by converting the Bangladesh Taka into foreign currency at the existing B.C selling rate of exchange. Care must be taken so that the limit of Bangladesh Taka is not exceeded in any way. The foreign currency value of the L/C must correspond the equivalent amount of Bangladesh Taka if LCA registered with Bangladesh Bank. The Authorized Official of the Authorized Dealer will check the L/C very carefully and signed the same jointly and forward the 1st and 2nd copy to their foreign correspondent situated at the nearest place of the exporter. Thus Bank is known as Advising Bank. On receipt of the L/C the Advising Bank after verification of the duplicate copy at their end. On getting the L/C the exporter prepares the goods and ship the same as per instruction of the L/C and obtain a Bill or Lading from the shipping Authority. The exporter will prepare bill of exchange, Invoice and other documents as specified in the L/C and submits the same along with the original copy L/C to his bank within the time mentioned in the L/C. The Bank with whom the exporter submits the documents is known as Negotiating Bank as this negotiates the documents i.e. make payment to the exporters. The negotiating bank will scrutinize the documents with terms and conditions of the L/C very carefully. If every thing is in order the bank will make payment of the amount of L/C to exporter in their local currency by debiting to their own account. Subsequently the negotiating bank will claim the L/C with whom the Head Office of L/C opening bank maintained foreign currency amount. This is known as Reimbursing Bank. Reimbursing Bank will make payment to the negotiating bank by debit to L/C opening Bank’s Head Office A/C. Simultaneously the negotiating bank will forward all the documents submitted by the exporter to the L/C opening bank as per instruction of the L/C. The date of forwarding letter of negotiating bank should be date of negotiation of documents. On receipt of the shipping documents from the negotiating bank, the L/C opening bank will carefully scrutinize the documents with terms and conditions of the relative L/C. If there is no discrepancy, the documents will be lodged. Lodgment of documents means the entry of the particulars of the documents in the Register and preparation of vouchers by converting the foreign currency amount into Bangladesh Taka as the exchange rate prevailing on that date. This amount is due to the importer. The importer will be asked to take delivery documents by making payment of the bill amount excluding the margin deposited at the time of opening L/C. Payment of bill amount and to take delivery of documents by the importers is known as Retirement of Import Bills. After taking delivery of documents from the L/C opening bank, the importer will clear the goods which has already been arrived or due to arrive from the customs authority on submission of these documents along with the custom purpose copy of LCA From. Loan Against Imported Merchandise (LIM) is a facility provided by the Bank to the importers who are in shortage of fund to retire the import bills and thus to clear the goods from the post authority. In other works it may be referred as an advance against merchandise. After lodgment of documents, the importers concerned to be intimated for early retirement of the documents by paying outstanding bill amount including other charge. If the importer is not in a position to retire the bill out of his own sources at that moment may request the bank to clear the goods by creating LIM Account. On receipt of the importer request the official of the import bills section will prepare an office note by calculating the total landed cost of the consignment. To ascertain the landed cost the following points to be considered. Efforts should be taken so that at least 20% to 30% margin of the landed cost may realize from the importer. Realization of margin will depend on the banker customer relationship and also on the marketability of the goods. The branches Manager are not empowered to sanction the LIM A/Cs in favor of the importers for clearance the goods without obtaining the approval from Head Office. On getting approval from Head Office on the Office Note the branch will send the documents to the port city branch by indorsing the bill of lading in favor of them with certification of invoice for clearance the goods through importers nominated as well as Bank’s approval C & F agent. In the forwarding letter clear instructions to be given for dispatching the goods either by train or by truck duly insured Branch Managers will have to take prior approval from International Division, Head Office to create LIM Account in favor of importers. Before sending the documents to the port city branch and under taking on prescribed from with special adhesive stamp of Tk. 80/- (Flexible) regarding the stipulated period sanctioned to the importer to be obtained. After clearance, the goods should be stared either in Bank’s go down or in importer’s go down under bank’s lock and key and the particulars of goods to be entered in the space provided in the LIM Register. At the same time issuance of goods covering fire and other risk to be made. Go down staff salary, go down rent (if the goods stored at the Bank’s go down) and other miscellaneous charges in connection with the LIM A/C will be paid by debit to party’s LIM A/C under advice to the importer. The bank has wide network of correspondents over the world, which enables it to procure good business during the year. The volume of import handle by the bank during the year 2008 was TK. 17560 million. The table 01 shows the amount of Import of IFIC Bank Ltd. During 2004 to 2008. In Million Tk. 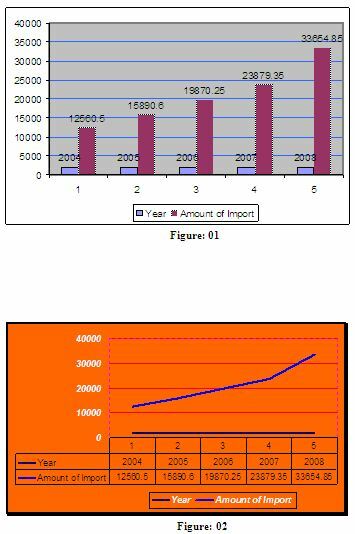 Explanation: From the above table it indicates that the amount of Import from 2004 to 2008 is continuously increasing to all the years of study. In 2004, the amount Import is TK. 12560.5 only and the last year in 2008, the amount of import is 33654.85 which are higher. And the average amount of import is TK. 21171.11 only. The Foreign Remittance department of IFIC Nawabpur Road Branch is equipped with a number of foreign remittance facilities. Following are the types of foreign remittance facilities offered by IFIC Nawabpur Road Branch. Disbursement of the cash of incoming F.T.T. Superior Quality: IFIC Bank provides its customers excellent quality of service. It gives the first priority to customer satisfaction. Dynamism: IFIC Bank draws its strength from the adaptability and dynamism it possesses. It has quickly adapted to world class standard in terms of banking services. IFIC Bank has also adapted state of the art technology to connect with the world for better communication to integrate facilities. Financial Strength: IFIC Bank is a finally sound company backed by the huge resource. As result customers feel comfortable in dealing with the company. Efficient Management: All the levels of the management of IFIC Bank are solely directed to maintain a culture of the betterment of the quality of the service and development of a corporate brand image in the market through organization wide term approach and open communication system. State of the Art Technology: IFIC Bank utilizes state-of-the-art technology to ensure consistent quality and operation. The corporate office is equipped with SWIFT (SWIFT is a banking software, used by IFIC Bank). All other branches are also equipped with SWIFT system. Experts: The key contributing factor behind the success of the IFIC Bank is its employee, who is highly trained and most competent in their own field. Bank Asia provides their employees training both in-house and out side job. In-House Utility: IFIC Bank is free from dependence on ever disruptive power supply of our public sources. The company generates the required power through generator fed on diesel. Water generation is done by deep tube wells on site and in abundance. Excellent Working Environment: IFIC Bank provides its workforce an excellent place to work in. Total complex has been centrally air conditioned. The interior decoration was done exquisitely with choice of soothing colors and blend of artistic that is comparable to any overseas bank. Limited Workforce: IFIC Bank has limited human resources compared to its financial activities. There are not many people to perform most of the tasks. As a result many of the employees are burdened with extra workloads and work late hours with out any overtime facilities. This might cause high employee turnover that will prove to be too costly to avoid. Problem in Delivery: Few of the IFIC Bank products offered to its clients like “Personal Credit (PC)” is lying idle due to proper marketing initiative from the management. These products can easily be made available in attractive ways to increases its client base as well as its deposit status. Government Support: Government of Bangladesh has rendered its full support to the banking sector for a sound financial status of the country, as it has become one of the vital sources of employment in the country now. Such government concern will facilitate and support the long-term vision of IFIC Bank. Evaluation of E-Banking: Emergence of e-banking will open more scope for Bank Asia to reach the clients not only in Bangladesh but also in the global banking arena. Although the bank has already entered the world of e-banking but yet to provide full electronic banking facilities to its customer. A proper blend of Banking and information technology might give the bank leverage to its competitors. Nevertheless there are ample opportunities for IFIC Bank to go for product innovation in line with the modern day need. The bank has yet to develop credit card facility, lease financing and merchant banking. Merger and Acquisition: The worldwide trend of merging and acquisition in financial institution is causing concentration. The industry and competitors are increasing in power their respective areas. Poor Telecommunication Infrastructure: As previously mentioned, the world is advancing e-technology very rapidly. Though IFIC Bank has taken effort to join the stream of information technology, it is not possible to complete the mission due to poor technology and infrastructure of our country. Frequent Currency Devaluation: Frequent devaluation of Taka exchange rate fluctuations and particularly South-East Asian currency crisis adversely affects the business globally. Emergence of Competitors: Due to high customer demand, more and more financial institutions are being introduced in the country. There are already 52 banks of various types are operating in the country. Many banks are entering the market with new and lucrative products. The market for banking industry is now a buyer dominated market. Unless IFIC Bank can come up with attractive financial products in the market, it will have to face steep competition in the days to come. Modern technique equipment such computer is not sufficient in Foreign Exchange department. As a result some process takes a long time to perform, when it is need. Employees are exposed to customer excessively which is an obstacle in systematic and prompt service. On line banking does not appear in all of the braches. In Nawabpur branch, there are several employees those are not enough to perform the daily banking activities. Sometimes the clients are discourages to open new L/C because of the shortages of the necessary document to open L/C. The Foreign Exchange Department of a Banks is strongly regulated by the central bank of Bangladesh but due to lack of knowledge or experience of the employees the rules are not always maintained strictly. To open a new L/C, Bank takes long time for approval for a new customer as if the bank sent it for approval to the Head office. Some employee in Foreign Exchange section moves from one desk to another desk due to lack of banking knowledge. IFIC Bank Limited (IFIC) playing a vital role in financing import and exports of the country. Without Bank’s co-operation, it is not possible to run any business or production activity in this age. Exports and import need finance in various stages of their activities. 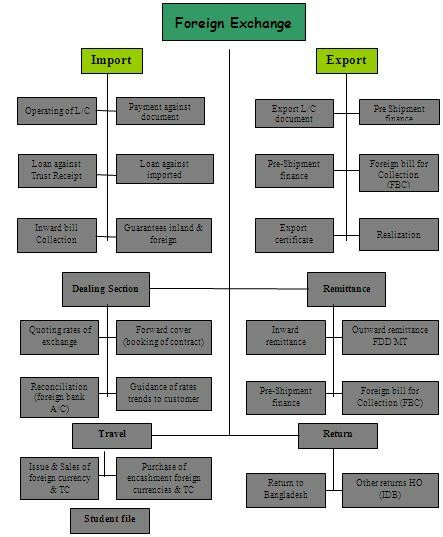 Export and import financing are letter of credit (L/C), payment against documents (PAD), loan against imported merchandise (LIM) etc. All these facilities are provided by IFIC. For this purpose Bank’s consider the borrower’s business standing, integrity, liability with the bank term and conditions of the L/C. There is lot of risks involved in foreign business. So, the IFIC Bank Limited (IFIC) has to clearly justify the customers from a neutral point and gather the current information about the market. Bank should follow easiest way of L/C procedure, as if new clients can easily doing this business. And also quick run this process. Some Employees have lack of Banking and computer knowledge to perform daily banking operation, Bank should arrange training program to develop their skill. Bank should follow the rules and regulation of the central bank in each step. Online Banking should provide quick services to the customers. In Nawabpur branch, bank should increase the employees so that they can serve their customers properly.